Miller & Wilson's Theater of Marvels will open its fourth performance season at Otter Creek Hall on Saturday, June 27, at 7:00 pm as part of Bar Harbor's Legacy of the Arts festival. Magicians Professor Miller and Dr. Wilson will be joined by the three-member bellydance group Mystic Gypsy as well as by an additional solo dancer. Theater of Marvels began as a collaboration between two magicians seeking to develop material that goes beyond the colorful surprises of conventional magic. They open the show with as much beautiful magic as they can pack into a brief "nightclub" segment. Then they put aside the beautiful silks and floating objects to explore some of the traditional magic of the East. Professor Miller researched the Hindoo Sands, a feat of Indian magic that was first performed in the United States in the nineteenth century. He found the secret of this amazing feat in the pages of a magic book published in the 1930s, and was able to duplicate it. Once he began to perform the Hindoo Sands, he received an email from a magician in India begging him for an explanation. Professor Miller is proud that his efforts to revive a feat of Indian magic have resulted in its return to its native land. Dr. Wilson found new material not in books, but in experiential training from performer Harley Newman, an expert in shamanism. Over a period of three days, Dr. Wilson and his fellow students explored the limits of human endurance through traditional feats like the Bed of Nails and the Ladder of Swords. He returned able to alter his heart rate and pain response, abilities which he demonstrates in performance. Besides the performances at Otter Creek Hall, Theater of Marvels has appeared at the annual banquet for the Bar Harbor Chamber of Commerce, the Great Boston Burlesque Exposition, and in collaboration with other performers throughout the state. Theater of Marvels was featured at Starry Starry Night, the New Year's Eve celebration in Orange, Massachusetts. 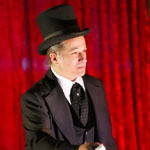 Professor Miller has won awards in magic competitions with his performance of the Chinese Rings and the Hindoo Sands. 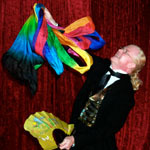 Dr. Wilson has been a featured performer at the annual Sideshow Gathering, at Jugglefest 2009, and has performed with the Bindlestiff Family Cirkus in New York City. Theater of Marvels has attracted the interest of local bellydancers, who joined the show on a regular basis last season. This year, dance groups Tribal Spice, Mystic Gypsy, Paradigm East and several solo dancers will join the Theater of Marvels throughout the season. Admission is only $8 for adults, $5 for persons 12 and under, and free for those 2 and under. The performances benefit the Otter Creek Aid Society, which maintains the historic Otter Creek Hall. Bar Harbor is the best place to be in Maine for the Fourth of July! The Fourth of July parade is like nothing that you have ever seen! 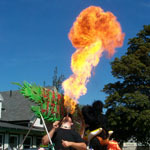 The parade has elements from traditional to fantastical woven together. Don't miss the Independence Day Parade on July 4 in Bar Harbor at 10:00 am. Dr. Wilson, Professor Miller, and friends will march in the parade handing out gifts! 6:00 - 10:00 am Blueberry Pancake breakfast on the ballfield, sponsored by MDI Rotary Club. Get your blueberry pancakes! 10:00 am Independence Day Parade through Bar Harbor. 11:00 am Seafood Festival on the ballfield, sponsored by MDI Rotary Club. A true feast of lobster, mussels, corn on the cob, strawberry shortcake and more! 11:00 am - 1:00 pm Children's Fair on the ballfield, to benefit Special Children's Friends. 12:00 pm Lobster Races on the ballfield, sponsored by the MDI YMCA. 9:00 pm Fireworks over Frenchman Bay. Dr. Wilson joins the staff of artists teaching at Summer Festival of the Arts on Mount Desert Island. 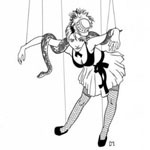 Students in SFOA magic class will learn the basics of the art of illusion, from magic with small objects in close up performance to stage-filling illusions for the theater. Don't miss the stage magic performance by students of magic in the Finale Weekend show! Miller & Wilson's Theater of Marvels arrives its fourth season, Saturday nights at 7:00 pm at the Otter Creek Hall. You'll see Professor Miller and Dr. Wilson perform wonderful feats of conjuration, strange Hindoo Jadoo, exotic Chinese magic, and Feats of Daring. Please see the web site for Miller and Wilson's Theater of Marvels for more information and photos. Admission is only $8 per person, $5 for persons 12 years of age and under, and free for those two and under. The performances benefit the Otter Creek Aid Society, which maintains the historic Otter Creek Hall. 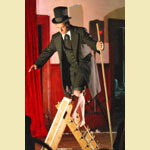 Dr. Wilson will appear in The Odditorium, Boston's very own circus side show, on Friday, October 9, at the YMCA Theatre in Cambridge. There will be a seance from 6:30 - 7:00 pm hosted by medium Rory Raven. The doors to The Odditoriun open at 7:15 pm for an 8:00 pm curtain. Please see the web site for The Odditorium for more information. Tickets go on sale September 21! Dr. Wilson is a member of the International Brotherhood of Magicians, and is currently serving as the Secretary of I.B.M. Ring 362, based in Bangor, Maine.